[S418] Chicago Tribune, online, Record Number: 19151227dn022. 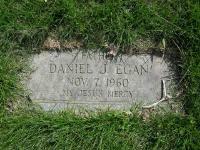 Death*: He died on 7 November 1960 at Chicago, Cook, Illinois, USA, at age 78. Daniel Egan, 78, of 8823 Honore st., was killed at 87th and Honore street when he was struck by a car driven by Patrick Donohue, 18, of 4821 109th st., a student at Wilson Junior college. 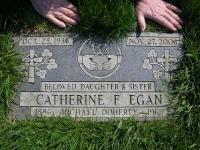 Donohue told police he didn't see Egan. Chicago Daily Tribune, November 8, 1960, page A7. Funeral arrangements are being completed for Daniel Egan, 78, of 8623 S. Honore st., who was fatally injured late Monday afternoon when he was struck by an auto while he was crossing the intersection at W. 87th and S. Wood sts. [S2738] 1930 U.S. Census, Washington, DC, T626, roll 447, page 23B; ED 720, A border in the Scally household. His wife, Mary, had died three years before. Accessed Ancestry.com 2016. [S2738] 1930 U.S. Census, Washington, DC, T626, roll 447, page 23B; ED 720, A border in the Scally household. His wife, Mary, had died three years before. 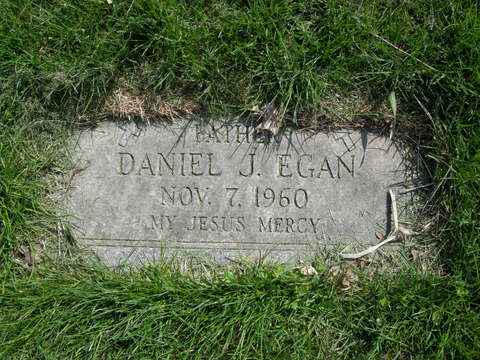 There is a John Egan living with him who immigrated in 1929, might be related. Accessed Ancestry.com 2016. [S412] David Heuck, "Heuck to Watson email May 19, 2004," e-mail to Elaine Watson, May 19, 2004.